Starbucks Korea’s 2018 Christmas spread is what we live for. Kicking off the holiday season at Starbucks Korea are delightful menu offerings, which include Holiday Milk Chocolate, Toffee Nut Latte, Chocolate Festival Cake, and Lemon Ginger Chai Tea. Up for grabs for Starbucks Korea customers are colorful planners for 2019. Exciting Christmas drinks and eats also await at Starbucks in the Philippines. If there’s one thing Starbucks lovers look forward to every year, it would be the coffee chain’s holiday spread that always delights. Beyond the culture of coffee, it’s become a global tradition to gather at the table with friends and family over (red) cups of coffee and sweet pastries. It’s proven to be not just an annual event, but a very magical one. The drinks photographed above are Lemon Ginger Chai Tea, Toffee Nut Latte, and Holiday Milk Chocolate, which is too cute to be consumed! These Starbucks Christmas drinks are best paired with these yummy food and pastries: Sriracha Chicken Sandwich, Chocolate Festival Cake, Caramel Cake, Christmas red croissant, Christmas green Croissant, and Christmas scones. 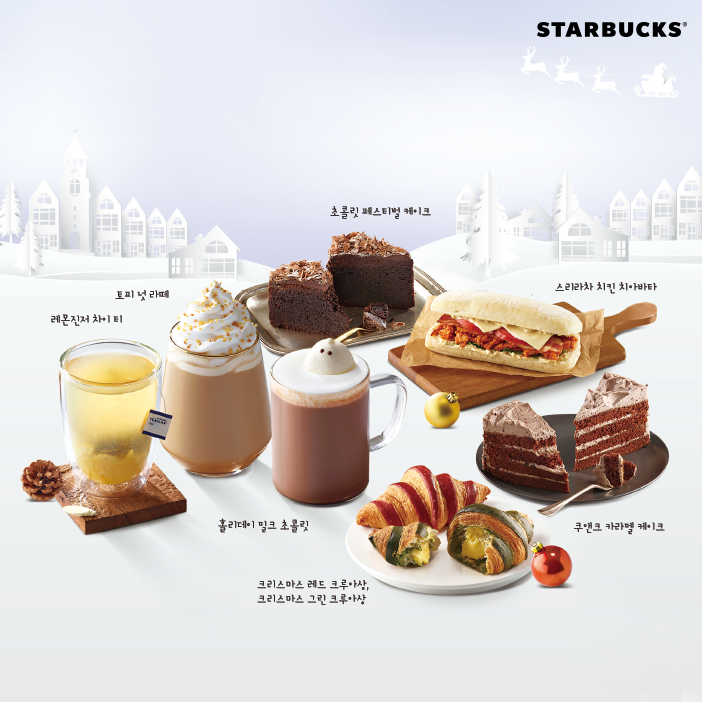 Of course, if you’re into collecting Starbucks cards, you can opt to get Starbucks Korea’s Christmas edition as well. If you’d like to add Starbucks tumblers and mugs from Korea to your collection, there’s also a great variety to choose from this season. You can avail these merchandise in your visit to any Starbucks store in Korea. For your bragging rights and caffeine fix, why not visit the largest Starbucks store in South Korea? 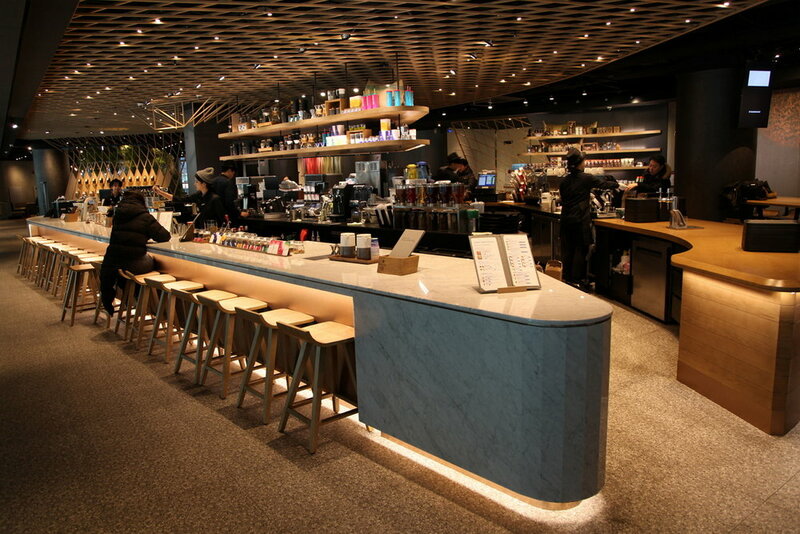 Starbucks Jongro has a floor area of 1,000 meters and features a triangular ‘grand bar’, ‘coffee stage’, and seating zones that are inspired by the Chosun dynasty. The address is found below, and you can find more details about Starbucks Jongro here. Another Starbucks store in Korea that café-lovers must visit is the Famille Art Dome branch. The dome-shaped store is very instagrammable and evokes a dreamy feeling to its visitors. If you belong to the portion of society that always prefers to try a local café over a chain, you may want to visit Cafe Kinnor in Myeongdong. Cafe Kinnor Myeongdong’s menu items range from ₱240-700 (around $4.5-13.8). However, if you book online via Klook, you can score some nice discounts for treats like the Original Ice Flake and Strawberry Pancakes. If you’re looking for a Klook promo code to get even more discounts, you may refer to our Promos section. Planning to camp in a Starbucks or any café in Korea to get work done? You may want to consider buying this type of adapter. Of course, Starbucks Philippines also has their distinct set of Christmas drinks, food, and pastries. Topping the list is the Snowy Cranberry White Mocha, Cranberry Pistachio Turkey Flatbread, Almond Matcha Doughnut, and Vanilla Blueberry Cake. Aside from a Starbucks travel planner, customers in the Philippines now have a choice to redeem a very handy travel organizer. For more information, visit Starbucks Philippines Facebook Page. Don’t miss out! Like ManilaxSeoul on Facebook for more travel guides and features.